WASHINGTON, DC | NEW YORK, NY, August 29, 2018 – Tata Consultancy Services, (TCS), (BSE: 532540, NSE: TCS) a leading global IT services, consulting and business solutions organization, and Discovery Education, the leading provider of digital education content and professional development for K-12 classrooms has announced the launch of the TCS Discovery Education Ignite Innovation Student Challenge. The brand-new competition gives young innovators an amazing chance to win $10,000 and receive virtual mentorship from a team of TCS technology experts to bring their winning idea to life. The Ignite Innovation Student Challenge encourages sixth through eighth grade students to use computational thinking to create digital solutions that improve the world and solve problems impacting TCS’ social responsibility pillars of Our Planet, Health and Education. Middle school students (up to four students per team) are invited to craft a digital concept and submit their entries by creating a written description or a one to two-minute video. Entries must define a problem in one of TCS’ three social responsibility pillars; explain how their answer solves a local, national, or global issue; identify the population being served; explain at least three benefits of the digital solution; identify at least two computational thinking strategies used to develop the solution; and present thinking and planning using visuals. Submissions will be judged based on creativity, content, persuasiveness, and overall presentation. Ten winners will then be selected to receive prizes including the Grand Prize of a $10,000 scholarship and virtual mentorship with TCS mentors to bring their winning idea to life. Winners of the Top Pillar prizes in Our Planet, Health and Education will receive $7,500, and six Winner Circle prizes of $1,000 will be awarded. Winners will be announced in spring 2019. All video and written description entries must be submitted online at no later than December 13, 2018. Launched in 2017, is an initiative that combines the best of digital content, lesson plans, career vignettes, and professional learning to help teachers prepare their students for careers of the future. The initiative offers educators instructional resources and year-round curriculum support to ensure that computational thinking is embedded into core subjects such as math, sciences, arts and social studies. This interdisciplinary approach helps students to obtain the necessary skills required for 21 century careers across all industries. On a national level, Ignite My Future in School has a goal of engaging 20,000 teachers and one million U.S. students by 2021. As a first step towards this objective, TCS and Discovery Education have partnered with U.S. school districts in the Washington, D.C. area, Georgia, New York, North Carolina, Pennsylvania, Texas, Michigan and Wisconsin as early adopters and launch sites of this transdisciplinary approach. Since launching, IMFIS has provided training materials valued at more than $2 million and engaged over 185,000 students and 3,300 educators in all 50 states. 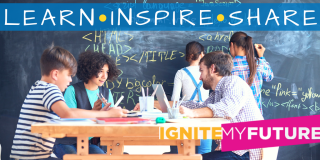 To learn more about Ignite My Future in School, go to www.ignitemyfutureinschool.org. For more information on the TCS Discovery Education Ignite Innovation Student Challenge, including idea starters, project flow, four-week roadmap, planning guide, templates, and complete rules, please visit www.IgniteMyFutureInSchool.org/Challenge. Tata Consultancy Services is an IT services, consulting and business solutions organization that has been partnering with many of the world’s largest businesses in their transformation journeys for the last fifty years. TCS offers a consulting-led, cognitive powered, integrated portfolio of IT, Business & Technology Services, and engineering. This is delivered through its unique Location Independent Agile delivery model, recognized as a benchmark of excellence in software development. A part of the Tata group, India's largest multinational business group, TCS has more than 400,000 of the world’s best-trained consultants in 46 countries. The company generated consolidated revenues of US $19.09 billion for year ended March 31, 2018 and is listed on the BSE (formerly Bombay Stock Exchange) and the NSE (National Stock Exchange) in India. TCS' proactive stance on climate change and award-winning work with communities across the world have earned it a place in leading sustainability indices such as the Dow Jones Sustainability Index (DJSI), MSCI Global Sustainability Index and the FTSE4Good Emerging Index. For more information, visit us at.